There has been increasing interest over the last few years in the use of cannabis for medical purposes. Governments at both Commonwealth and State and Territory levels have implemented legislative and policy change to allow the cultivation, manufacture, prescribing and dispensing of medicinal cannabis products for patients in Australia. This has been driven partly by community and advocacy groups and the media and informed by the development of medicinal cannabis programs in other countries. Cannabis is a genus of flowering plant in the family cannabaceae. It has a long history of medicinal use in several cultures, but has not been rigorously studied. Cannabis contains a variety of compounds (cannabinoids) which are ligands (binding agents) for cannabinoid receptors in the body. A variety of plant-derived and synthetic cannabinoids have been developed for medical use. For the purposes of this document, the terms medicinal cannabis and cannabinoids are used interchangeably. The Commonwealth Department of Health, with financial support from several state governments, commissioned a team from the Universities of New South Wales, Sydney and Queensland under the coordination of the National Drug and Alcohol Research Centre (NDARC) to review the available evidence for the use of medicinal cannabis in palliative care, chemotherapy-induced nausea and vomiting, chronic pain, multiple sclerosis and epilepsy. Early research into medicinal cannabis involved synthetic cannabinoid products including dronabinol and nabilone, whilst more recent studies have tended to use whole-plant extracts. Botanical marijuana contains many cannabinoids; the best known of which are delta-9 tetrahydrocannabinol (THC), cannabidiol (CBD) and cannabinol (CBN). It should be noted that use of cannabis products derived from plants may involve exposure to a mixture of cannabinoids, potentially changing from crop to crop. 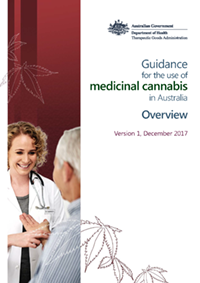 The Department has developed a series of guidance documents to assist health professionals and patients, especially medical practitioners, who choose to prescribe medicinal cannabis in Australia under current access schemes. Included is an overview addressing the evidence base for medicinal cannabis therapy generally as well as specific documents relating to medicinal cannabis in the treatment of palliative care, epilepsy, chemotherapy-induced nausea and vomiting (CINV), multiple sclerosis (MS) and chronic pain. The guidance documents are based on evidence available at the time of publication and will be regularly updated as new evidence emerges. Working groups have been established for the five different settings and will meet yearly to review evidence and make updates where required. It is hoped that sufficient data on the safety and efficacy will emerge in coming years to enable registration of more medicinal cannabis products on the Australian Register of Therapeutic Goods (ARTG). This guidance summarises the limited and disparate data available for medicinal cannabis use in specific treatment settings. It does not recommend use, nor does it intend to fill the gap in research that currently exists. The document's primary purpose is to support informed decision making and help the patient partner with their doctor in the therapeutic process by providing explanation and advice on the use of medicinal cannabis. acknowledges that in many cases there are very limited data from which to draw specific recommendations for treatment. The guidance therefore provides some background for medical practitioners and their patients interested potentially in prescribing medicinal cannabis products for particular conditions. whilst subject to peer development and review, has not gone through the formal National Health and Medical Research Council (NHMRC) process for developing clinical guidelines. In order to develop this set of guidance documents, the Australian Government Department of Health commissioned a review of previously published reviews from multiple databases such as Medline, Embase, PsychINFO and EBM Reviews based on PRISMA. PRISMA is the Preferred Reporting Items for Systematic Reviews and Meta-Analyses, and is an evidence-based minimum set of items for reporting on randomised controlled trials (RCTs). These guidelines have been developed because of concern for low quality trials and aim to improve the quality of medical research, remove bias and improve transparency and accurate reporting of findings. Searches were guided by a specialist Librarian using specific search terms and were limited to studies published between 1980 and early 2017. Two reviewers independently examined titles and abstracts for relevance using Covidence Software and the Cochrane Risk of Bias Tool was used to assess studies, aiming to increase accuracy. The GRADE (Grading of Recommendations, Assessment, Development and Evaluation) approach, an internationally recognised standard applying to weighting of evidence in scientific and medical literature was used to evaluate the quality of evidence. The scope of the guidance is broad, and not specific with regard to the use of medicinal cannabis for particular symptom clusters, but includes some suggestions for the use of single products or mixtures of cannabinoids and their routes of administration. As noted by the Queensland Government's Clinical Guidance for the Use of Medicinal Cannabis Products, medicinal cannabis is not considered a first-line therapy for any indication. Given the public interest, however, medical practitioners may be asked to prescribe these products by their patients. As with all therapies, medical practitioners must exercise their professional judgment in determining if this is an appropriate product for an individual patient. In general terms, the less critical the clinical need for the proposed product, the higher the degree of evidence needed to support the use of that product. At this time, we suggest that the use of medicinal cannabis may be considered only when registered medicines have been tried and proven unsuccessful in managing the patient's symptoms or medical condition. As reported by Nugent et al. in a recent systematic review, a majority of persons who seek medicinal cannabis do so for pain management. In this regard, medical practitioners should distinguish between the setting of palliative care and chronic non-cancer pain: In the latter setting, commencement of a medicinal cannabis product may expose the patient to life-long use of the medical cannabis product. There are no robust data regarding the consequences of such use. Medical practitioners should also be aware that there is no scientific data to support use of medicinal cannabis products for chronic nociceptive or musculo-skeletal pain, and the scientific data to support use of medicinal cannabis products for chronic neuropathic pain conditions is still limited. Therefore caution should be used if considering use of medicinal cannabis products for chronic non-cancer pain. While cannabinoids are less likely to be associated with severe adverse eventsthan, for example, opiate medicines details of adverse events with most cannabinoids are lacking. However the recent randomised controlled trial of cannabidiol (CBD) for drug-resistant seizures in Dravet syndrome showed significant adverse events including sedation, convulsions and gastrointestinal disturbance in some patients. CBD and THC, being lipid plant extracts, require metabolism before excretion. Although standard pharmacokinetic (PK) and pharmacodynamic (PD) studies have not been undertaken, from the small amount of clinical data we have, there are likely to be significant pharmacokinetic interactions, particularly with drugs that are metabolised by, or either inhibit or induce cytochrome P450 (CYP450) enzymes. Furthermore, patients should be advised that they are not able to drive while treated with medicinal cannabis. Patients should be informed that measurable concentrations of THC can be detected in saliva for many hours after administration. Medicinal cannabis products are generally regarded as having low acute toxicity, however concurrent use of other drugs may mask the effects of cannabis and severe toxicity including adverse cardiovascular effects and death may be under-recognised. In mammals the median lethal dose of THC has been estimated to be >800mg/kg. CBD appears to be of very low toxicity. Doses of 1000mg/kg CBD appear to have been tolerated safely in humans. Most cannabinoid metabolism occurs in the liver and involves the CYP450 pathway. THC accumulates in fatty tissue and is released slowly from this storage site. It is not clear if THC also persists in the brain. Given the limited scientific data to support its use in many circumstances, medical practitioners might consider discussing proposed treatment regimens with a colleague before commencement. Appropriate state or territory regulatory frameworks for access to medicinal cannabis need to be considered and specialist review or reports may need to be included with Special Access Scheme applications to the TGA. A medical practitioner should complete a comprehensive clinical assessment of the patient that identifies risk factors that will need to be addressed before applying for access to medicinal cannabis. that informed consent has been obtained and the patient provided with information about the medicinal cannabis product, possible side effects and treatment goals, and that treatment will be discontinued if benefit has not been demonstrated. Clinical PK and PD studies of oro-mucosal, oral and vaporised administration are currently being performed or have been undertaken. Most data on PK and PD are related to THC, although CBD PK data are being developed. Smoked cannabis results in more rapid onset of action (usually within minutes), higher blood levels of THC and a shorter duration of effect. Peak concentrations are reached within 30 minutes and the effects may last for two to four hours. Smoking is the most common route of administration for recreational cannabis use but a person's physical response shows considerable individual variability because of the unknown concentration of THC in the products being consumed. At least 40 per cent of the THC dose in the cannabis is lost in side stream/combustion when smoked, making it difficult to estimate the amount of THC an individual patient is receiving. For this reason, and due to the well-documented evidence that smoking in general is harmful, smoking of cannabis products should not be supported. Vaporised cannabis results in similar rapid absorption and high blood concentrations as smoking it. Cannabis is heated at a lower temperature than smoking, producing fewer toxins and no side stream "smoke", making passive smoking less of a problem. First effects occur within 90 seconds and reach a maximum after 15 to 30 minutes, before wearing off after two to four hours. Vaporising heats the cannabis without burning it and releases the cannabinoids and terpenes in the form of a vapour, which is then inhaled. Given the rapid onset of action, vaporising cannabis products is best for symptoms or conditions where rapid relief is required. The amounts of THC and other cannabinoids delivered by the vaporiser are dependent on the temperature, the duration of the vaporisation and the volume of the balloon in the vaporiser. No vaporisers are presently registered in Australia as therapeutic goods. Volcano Medic and Mighty Medic are registered as medical devices in Canada and Germany. A variety of vaporising technologies are on the market. If vaporised cannabis is to be used it is recommended that those which have been studied in a research setting and found to be safe and feasible are chosen for use. Medicinal cannabis products consumed as oils or liquid capsules are more slowly absorbed. Effects are generally delayed for 30-90 minutes. Bioavailability of oral cannabinoids is low (10-20 per cent) because of intestinal and first pass liver metabolism. Peak effects can occur two to four hours after consumption. Given the longer time frame, it is important to allow at least three hours between administration of single oral doses to avoid possible overdose. Effects can last eight hours and as long as 24 hours. Given the slower onset and longer duration, it is expected that taking medicinal cannabis products orally would be more useful for medical conditions or symptoms where control over longer periods of time is sought - similar to the use of slow release medications. Sprays appear to have similar mode of action as oral administration, as it is assumed that some of the product is swallowed. Effects typically start at about 90 minutes after administration and last about the same time as orally administered cannabinoids. Titration of dose may be easier with oromucosal spray than with oral formulations. THC is not generally well absorbed through the skin. CBD and CBN are 10 times more permeable than THC and are more likely to be used in topical preparations, although at least one transdermal THC product is in development. The time of onset and duration of action are unknown. There have been some reports of rash and itching, when the skin has come into contact with cannabis products. THC and its metabolites are excreted through faeces and urine. It may take up to five days for 80 to 90 per cent of the total dose to be excreted. THC may be detectable in the urine many days after ceasing use and the implications of this for safe driving need to be discussed with patients. The general principle should be "start low, go slow". Cannabis-naïve patients may only need 0.1–0.5 of the starting dose of a regular cannabis user to note effects (both positive and negative). In populations who are not naïve to cannabis, dosing advice should be to consider tolerance and accumulation of THC in fat stores. Information on pharmacovigilance should be collected by the prescribing doctor or pharmacist. Research in this area should be supported, particularly in an end-of-life setting in which cannabinoids will have different PK/PD properties than in a younger population. psychoactive or other side-effects are prohibitive (particularly for THC preparations). Medical cannabis products are not listed on the Pharmaceutical Benefits Scheme (PBS). Annual treatment costs must be met by the patient or a third party. Good manufacturing practice (GMP): a set of principles and procedures that, when followed, helps to ensure that therapeutic goods are of high quality. Negative affect: a broad concept that can be summarized as feelings of emotional distress; defined commonly by feelings of anxiety, sadness, fear, anger, guilt and shame, irritability, and other unpleasant emotions. Quality (evidence): evidence quality is assessed according to scientific guidelines regarding study design, number of participants, risk of bias and control for confounds. Palliative care: 'an approach that improves the quality of life of patients and their families facing the problem associated with life-threatening illness, through the prevention and relief of suffering by means of early identification and impeccable assessment and treatment of pain and other problems, physical, psychosocial and spiritual'. Standardised product: refers to a product which delivers a specified drug concentration and potency, and which has undergone quality control to ensure that the concentration and potency is consistent between batches of drug product. Stringer, D.M., Negative Affect, in Encyclopedia of Behavioral Medicine. 2013, Springer. p. 1303–1304. World Health Organisation. WHO definition of palliative care.